We had a chance to sit down with Nick Thomas, an Independent candidate for Congress in Colorado's 2nd Congressional district. Our conversation covered what the middle means, what makes America special, and why we all need to find some common ground. You just finished a "bipartisan tour across America." What did you try to accomplish during your time on the road? Our Bipartisanship Across America Tour was designed to highlight the desire across this country to right the ship of today's political problems. We are working to build a coalition of leaders in over a dozen cities throughout the country to help send a message to the two-party system in Congress. Two weeks ago, we stopped at the Little Rock Club in Little Rock, Arkansas, which followed an incredible opportunity the evening before where we spoke with other independents about how to increase cooperation in government. 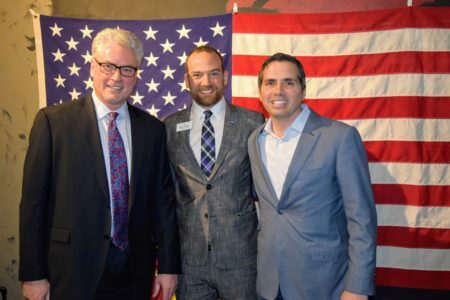 Craig O'Dear and Greg Orman - independents seeking office in Missouri and Kansas, respectively - joined us for a frank discussion on how we can best break the cycle of partisan politics at every level of our political process. We can accomplish a lot in this country by actively working together. Meeting like-minded leaders in cities like these has been an incredible experience. We're looking forward to building upon this momentum with the rest of the tour. So far on our website, we've profiled someone running as an independent for Governor and Senator. What would be the benefit of being one independent congressman in a house of over 400 voting members? You know, I get this question all the time. I will say that whatever path the Independent movement takes into its future role in the U.S. House, it would understandably have to start with a single victory. This is not about having just one Independent in Congress; it's about getting the first truly independent representative in there to lay the foundation for a successful nonpartisan movement to revolutionize politics. It's about creating a ripple in 2018 that can develop into a larger tidal wave against politics-as-usual. Can you explain what "leadership from the middle" would look like? We enjoyed billing our Kansas City tour stop as a panel discussion entitled 'Leading from the Middle,' referring initially to the competitive advantage of our nation's political and geographic center in leveraging and maintaining the 'wholesome community effort.' Middle America's communities are typically industrious, cooperative, and entrepreneurial by nature, and so taking those characteristics to the business of solving problems in Congress is the obvious next step. Independent voters are critical to breaking the partisan cycle, as we know, and I believe leadership from Middle America can lead that charge. With the sheer force of Independents here (the majority in my district), I believe we can show the country that a sincere effort to bring people together for common purpose goes a long way and can begin healing a few of the many divisions put on us by the us-verus-them-ers. Leading from the middle doesn't mean we're asking anyone to give up on their perfect ideals. It means we want people to meet at the table with those values - to learn, share, and collaborate. You've traveled extensively in your personal life. Based on that travel, what would you say is the best part of the American political system? What's the worst? I have lived, worked, and travelled to over 70 countries around the world and 49 states across our great nation. I've seen first hand how the confluence of diverse perspectives can lead to tremendous collaboration and outcomes. I believe our political institutions are, at their core, set up to capitalize on the diverse communities that make up our national body politic. Our representative government, particularly in the Senate, is a great platform for encouraging equal input from each state's unique perspective on national legislation. That said, I think the political parties have done the nation an incredible disservice by forcing elected officials to coalesce around a particular agenda in order to receive institutional support. That model unfairly promotes voting behaviors that may run counter to local communities' best interests. A Democrat in Chicago cannot be the same as a Democrat in New Mexico. Likewise, a Republican in New Jersey is certainly not homogenous in their politics as one in Wyoming. That the parties operate outside that fact is beyond common sense. You're talking to a crowd with 50 Trump supporters and 50 Clinton voters. What issue and/or idea do you bring up to help find political common ground? Let's talk about infrastructure, albeit in over-generalized terms. Say 50 Clinton voters are keen on seeing new models for transportation that encourage alternative energies, smart technologies, and equitable access across socioeconomic lines. Those 50 Trump voters are by-and-large interested in job creation, properly maintained systems to move people and product, and revenue-neutral government projects. There's a clear way to achieve those goals through infrastructure investments founded through common purpose, but it's not going to happen if both parties continue vilify each other. It's up to independents like myself to help convene them, as party leaders are clearly unwilling to do so.